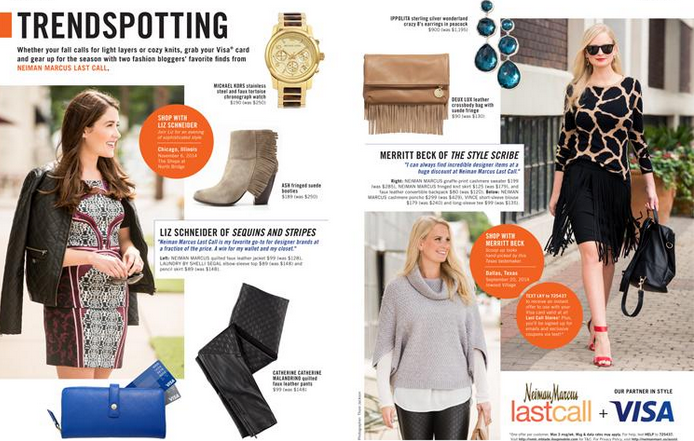 If you picked up Lucky Magazine‘s September issue, you may have seen a familiar face on its pages! If you didn’t, go pick up the issue right this second!! The October issue will be hitting stands in a few days, so don’t miss out. You may recall a few Instagrams (exhibits A, B and C!) from the shoot back in June, but if not, I had the chance to partner with Last Call Studio and Lucky Magazine on a super fun feature for this month’s issue, showcasing Last Call’s amazing new fall merchandise! In addition to the mag feature, I’m also excited to announce I’ll be hosting a fall fashion event at Last Call Studio in Dallas’ Inwood Village this Saturday! 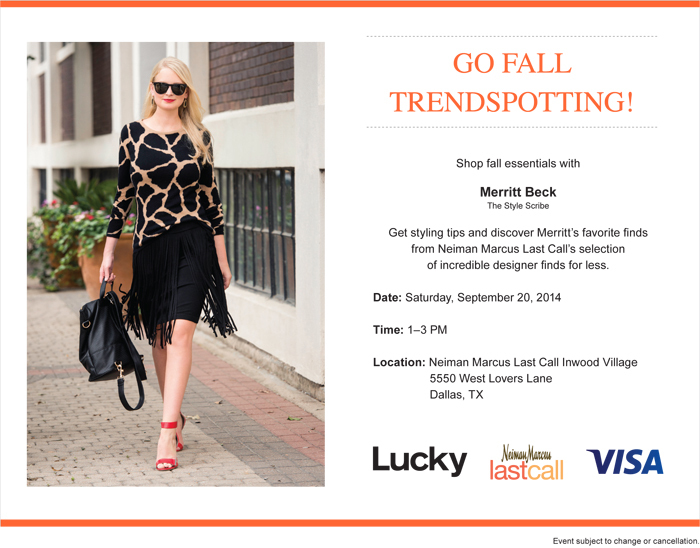 For those of you in the Dallas area, come by Last Call Studio between 1pm-3pm this Saturday to enjoy a short presentation with me and a Lucky style expert, and to shop my favorite fall picks from designers I love! It’s going to be so fun – there will be a DJ, photobooth, and more! I hope you all can join me in what is sure to be a blast of an afternoon. Congrats! Your profile looks amazing! Yes I saw and you looked amazing in it. Congrats lady! I was so excited when I saw this in my issue – you look fabulous…congrats!! Love all the fringe! Congratulations! Congrats Merritt! So excited for you!!!! you look amazing! that fringe skirt is killer! you look gorgeous, merritt- congrats! Merritt that is so cool. The feature is amazing! Congratulations on the feature! So exciting! Congrats! I’ll have to go pick up a copy immediately. Congrats on the feature! You look amazing in these photos. I’m obsessed with that poncho and those leather leggings. Congrats Merritt!! I was so excited to see you in this month’s issue. Thats so awesome.. you deserve it !! Congrats! you look stunning in the feature and I’m thrilled for you;) This is so awesome. Congratulations! I wish I lived closer! such an awesome feature merritt! love both of your looks, and you look gorgeous always :) liz and i are sorority sisters so obviously love seeing the two of you together!! Love this! Congrats on the feature! You look beautiful in the pictures!